The My Docs Online website is a great way for you and I to store files in the cloud. Using the website is easy – it’s accessible from anywhere and using it is simple. However, there are a few things that we’d like to do that we just can’t do through the website. The My Docs development team has heard our requests and they’re in the beta test phase of introducing a new desktop based application. This application will do a number of things that, because of the nature of web browsers, can’t be done through Internet Explorer, Firefox, Chrome or other browsers. I’ve been working with a number of you who are beta testing this new product and you’re telling me both what you like about it and the features that you’d like to see added. File compression on all uploads and downloads – This is mentioned often as a big time saver, especially for users who upload and download lots of files and folders each day. The “Open Last Folder” at login option – Those of you using this option (it’s in the preferences section) really like the way the app takes you directly to the last folder used as soon as you log in. Drag-and-drop or file select for file uploads – I’ve always been a big fan of using file select for uploads but many of you report a preference for drag-and-drop file uploading. This new app allows us to upload files either way. Easily login into and out of multiple accounts – Some of you maintain multiple My Docs Online accounts and mentioned this as a much easier way of accessing them. 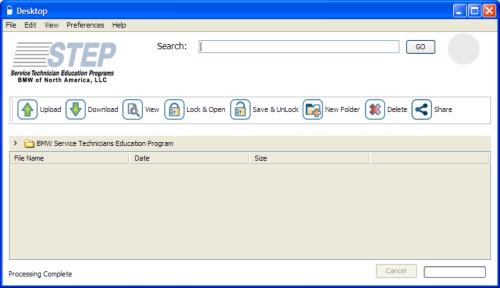 Being able to lock the files you’re working on – (It was the power users among you that mentioned file locking.) The desktop app allows you to apply file locks to any file type. This means that you can “Lock and Open” any file in your account without fear of any of your other team members trying to update the file while you have it open. When you’re done with your changes you simply “Save and Unlock” the file and it’s available for use by any other team member. Not surprisingly there were also features that are not yet in the beta version of the Desktop App that you’ve requested as well. The most requested feature available through the website that is not yet available in the Desktop App is the “give” feature that you use to share files with people who may not be My Docs Online users. The Dev team hopes that you see the Desktop App as a useful addition to the My Docs Online website. If you’d like more information on the beta test program, or if you’re interested in helping us test the new product (we’d love to hear your feedback) please send me an email using the [email protected] email address.